Showing results for tags 'reales'. Who drew/sculpted the original portrait of Charles III & IV that appear on the Spanish Reales? I read Jeronimo Antonio Gil was the head engraver at the Mexican mint and that he produced special medals commemorating the coronation of Charles III, death of Charles III, and coronation of Charles IV, but who created the bust images featured on the reales? Ecuadorian Trial Coin Dated 1832 Many know that when Ecuador's mint began to operate, it was given the task of revaluing or demonetizing base metal coins, most of them denominated in Reales and minted in Popayan, Colombia. It is common knowledge that in Quito the clandestine manufacture of counterfeit coins of base metal or low silver content was widespread in the early days of the republic. This clandestine manufacture of spurious coins proliferated between 1828 and 1831; this being the reason one of the first tasks of the Quito mint was to identify the coins of 1 real of Popayan that had little or no silver. Typically their silver content was less than thirty percent and the solution effected was to countermark these low fineness coins with the letters "Mo" (medio = half), to reduce the face value by half. We must consider that the Quito mint also had the job of countermarking the coins from Cundinamarca (modern day Colombia) of correct fineness with the monogram MDQ (Moneda de Quito), which was established by the decree on December 26, 1832 issued by GeneralFlores. That work was begun in early 1833. Likewise, we know that in addition to that tedious work of reviewing the problematic issues of Popayan, they had to acquire and set up the equipment necessary to begin minting of the first coins. The machinery was ready by the middle of 1832, and the first coinage was struck on August 30 of that year (Ref. La Moneda Ecuatoriana a través de los Tiempos de Melvin Hoyos, segunda edición, pág. 79). So far there is nothing new; everything is perfectly detailed in several works. But what is still not known is the denomination of the trial coins that were made in August of 1832! In the opinion of some investigators this emission supposedly had been minted with the date of the following year (1833); that is to say, that somehow the operatives, the engraver who made the die, the assayer Guillermo Jameson and the Director of the mint, Colonel Alberto Salazza, divined that the decree ordering the start of operations would not be issued until the following year. All this in spite of the pressure they had to assemble the machinery of the mint as soon as possible, due to the pressing need for circulating coins in the country. This scenario would have us believe that the staff of the mint assumes that President Flores should issue the decree with speed so that those coins came out the same year they were coined, 1832. That is what common sense dictated, although in practice this did not happen, for indeed the decree did not come until the following year (1833), but the staff of the mint had no way of knowing that the authorization would be delayed almost a year. That scenario, in my opinion, had to do the opposite, to suggest to the staff of the mint, that President Flores should issue the decree quickly so that those coins would circulate the same year they were minted, that is 1832, this indicated the logic, although in practice that did not happen, because the decree came out the following year, but the staff of the mint did not know that the issuance of the order would be delayed for so long. On the other hand the book by Eliecer Enriquez, "Quito a través de los siglos", makes reference to a hypothesis that the test coins minted on August 30, 1832 were the 2 reales; and Melvin Hoyos supports this hypothesis in the absence of any report of the starting date for the coinage of the 2 reales of 1833, which one could presume was a trial coinage. This hypothesis is very logical, which is why almost nobody rejects the idea that 2 reales were coined in August 1832; but the fact that there was no report of the start of these coins does not mean that there could not be other reasons. One must remember that the minting of the two reales denomination was irregular with few pieces minted. The scheduled quantity was never achieved because the coin press suffered damage. I believe this may have been the reason that no such report was issued. Moreover, Melvin Hoyos mentions in his second edition, in Item #7 on page 102, of his work "La moneda ecuatoriana a través de los Tiempos" that Colonel Salazzá sent a report to the Ministry of Finance, dated September 13, 1833 , informing of the impossibility of repairing the screw of the press, (“el tornillo del Balancín de la máquina de acuñar”) and that until that date the mint had only managed to produce 400 pesos in two reales coins; that is to say, they only minted 1,600 pieces of 2 reales up to the 13 of September of 1833. However, in the production report that Colonel Salazzá presented to the Ministry of Finance in 1836, he reported a total production of 5122 pesos in pesetas dated 1833, or in other words, 20,488 pieces of 2 reales. Then we can easily conclude that 18,888 pesetas had to be minted after 13 September 1833 to complete the production reported by Salazzá, after the repair of the coin press was accomplished. It is a great mystery that historians must continue to investigate, to discover exactly when and how the pieces of 2 reales of 1833 were coined. Until now it is only been possible to raise some conjectures. In my personal opinion, I can say that when it is necessary to put coins into circulation to satisfy an urgent demand, logic dictates that you begin with the coins that are most needed, which are normally smaller fractional coins, since it is the most requested currency for the majority of transactions. This was demonstrated when we confirm that the first pieces that were put in circulation were the half real, and in the followed month the 1 real coins. So, if it was known what monetary denomination was going to have the highest initial demand, why would the mint decide to make a trial 2 Reales coin in August of 1832? This does not seem very logical. As I indicated above logic dictated that they should have begun trials with the most needed coin, which was the ½ real. Anyway, whatever the denomination of the trial coins, in my opinion, these should have been minted with the date of 1832, because they were made in August of that year, and surely the staff of the Quito mint could not imagine that the authorization would not be made until the following year. This theory was substantiated by a young collector who showed me a ½ real coin from his collection, which was extremely worn, but the 1832 date was clearly visible. I told him that this piece was extremely rare, that perhaps it could be the link that could define the mystery of the pieces of proof that were minted in August of 1832. In my opinion there was no doubt about the date that was observed on the coin. However, in order to confirm this observation, we sent the coin to one of the recognized coin certifiers, in this case NGC. Unfortunately this piece could not be certified because of its extremely poor condition. However, the certifier registered this piece dated 1832, and thus was established in registry 2810734-005 as ½ REAL 1832 GJ "NOT SUITABLE FOR CERTIFICATION" It is worth mentioning that when the certifiers cannot confirm the authenticity of a coin, they register it as "QUESTIONABLE AUTHENTICITY" as case 2813928-003; or "ALTERED DATE" if the date was altered, such as case 3719808-007; or "INELIGIBLE TYPE" when they cannot identify with certainty the type of coin, such as case 2795087-006 (coin of 5 sucres 1944 with the countermark for 75 years of the Ecuadorian Central Bank). But in the particular case of this coin of ½ real, none of those qualifiers was considered; they did not question the authenticity of the coin or that the date was altered, nor if the piece was unidentifiable. In addition to that specimen, I knew of another case from a different third party grading service, ANACS that recorded the existence of another piece of ½ Real with overdate (1833/2) with number 4732077; that is, a 3 over 2, which was put up for auction by HERITAGE, in January 2013, described as a “MoR” (medio real), unlisted overdate. These two examples make me ponder the possibility that the emission of trials, made in August 1832, could have been the coin of ½ real minted with the date of 1832, and not the 2 reales minted with date 1833 as many historians think. And, as I said earlier it would have been illogical to begin testing with the highest denomination silver coin, and even worse with the date of a year yet to come. If my hypothesis is correct, there should be more pieces of ½ real 1833 with overdate that could be in some collections, unnoticed by their owners, because this error was attributed to the poor quality of the details of a rather than a smaller punch. To confirm this, I made a visual inspection of some pieces of ½ real 1833, in which I was able to observe an important detail in the minting of some of these coins. It was observed that most of the ½ real coins of 1833 have a totally clear date, in which the 4 digits are quite clear, keeping a proportionality and alignment between the digits. But there are other pieces in which it was observed that the date are not clear, being the rarest thing that in those cases the distortion of the digits of the date appeared only in last or two last numbers, and in a few cases it was visualized larger digits and their location was not aligned with the first 2, they were located in an upward stair position. The ½ real coins that have a warp on the date have a peculiarity, and none of them have a similar problem in the first two digits of the year. This is rare, because this anomaly was always attributed to the poor quality that Orellana gave to the punches of those pieces, but nobody has questioned that this anomaly is only observed in the final digits of the year. That is to say, we must believe that in the various punches that were made for the elaboration of these pieces, they only had a bad finishing engraving only in those digits. Or failing that, the pieces were so small that when they were struck the error occurred exactly in the same position of the coin affecting only those digits. Is that what we should believe what happened with those coins? I resist that belief. It is very unusual that there is only a warp in the last digits and it makes me think about the following question: Why is this warp presented only in the last digits of the date? The only hypothetical answer I find is that this warp is not a product of the quality of the elaboration of the punch, nor of an error in the strike of the pieces when they were made; it makes me think about the possibility that they are corrections made in the dies, most probably engraved in 1832 to start the production that supposedly had to start in the middle of that year, is what the staff of the mint should have assumed, the enormous urgency of demand of coins that the country had, added to the pressure that they had to have the machines installed as soon as possible. But as the decree was not signed until the following year, it is very likely that it would be necessary to correct those dies to be able to use them, obtaining some pieces with this peculiarity. The little test production that was made in August of 1832 must have been a few pieces with the date of the year 1832, which may or may not have been released, but only this piece of ½ real 1832 has been found in the records of the NGC and that it is probably unique. We must remember that when President Flores gave the authorization for the implementation of the Quito Mint, it was necessary to obtain information from the Lima mint in December 1831, because the tense situation that existed between the Government of Ecuador and of New Granada (modern day Colombia) did not allow the support of the mints of Popayán and Bogotá (“La Moneda Ecuatoriana a través de los tiempos”- segunda edición, pag. 74). Remember also that in Lima it was customary to correct the dies to reuse them in the following years, this is observed in the mintings of the House of Lima del Cuartillo (KM # 143.1) of 1830/28, 1831/0, 1834/3, 1836 / 5, 1839/8, 1842/32, 1843/32, 1845/36, as well as the ½ reales (KM # 144.1) of the years 1827/6, 1829/8, 1833/2, 1835/3, 1836 / 5, in the 2 reales (KM # 95) of 1803/2, 1807/0, in the 8 reales of 1803/2, 1815/4 among other copies. Thus we observed that the dies were not only corrected the final digit of the year, otherwise in many cases corrected to the last 2 digits. If they looked for all the information on how things worked in the Lima mint, it makes me think, if it were possible that the custom of correcting the dies was also transmitted to the Quito mint. If this hypothesis is true, it would explain why there are corrected dies in the last 2 last digits, as we observed in some specimens. 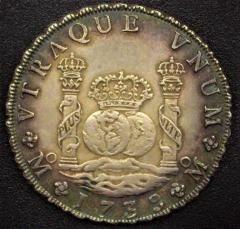 The mystery of 2 reales 1833. Melvin Hoyos could be right, stating that the mint started producing the Ecuadorian coinage at the end of December 1832, and that the production should have started with the ½ Real coins with the error of the denomination in fraction made by Juan Orellana as a major engraver. We must also mention that Mr. Juan Orellana was the first major engraver in the Quito mint from 1832 to March 1833 when he was replaced by Eduardo Coronel. Mr. Orellana was in charge of making the first silver issues of ½, 1 and 2 reales. First coins of ½, 1 and 2 reales minted in the mint, attributed to the carver Juan Orellana. Can see the main characteristics that attribute them to him, such as the rustic work of the pieces, the position of the birds, the overlap of the mountains that form the valley in V, the teeth of the ring that are unmistakable details, among others. In addition, some historians suggest that the piece of 2 reales could also have begun its coinage in 1832, at least the 1,600 pieces that Salazzá confirmed its production in the report of September 13, 1833 to the Ministry of Finance, reporting the impossibility of repairing the screw. But in my opinion, in no way could those 2 real coins be the trial coins, made in August 1832, because any coins that had been made on that date, should have shown the year in which the test was done, and not the year following. It is not clear if the coins of 2 reales began to be minted in 1832 or early 1833, what I can say with complete certainty is that this denomination, despite the low production, was worked by both engravers, Juan Orellana and Eduardo Coronel, contrary to what many historians think that they attribute the production of the pesetas of 1833 only to Mr. Orellana, because they consider these pieces as the emission of evidence made in August 1832. To verify the aforementioned, we can confirm that there are coins of 2 reales 1833 with the finished characteristic of each of the engravers. This is confirmed by the certified coins NGC 4327326-009 which has all the characteristics that can be attributed to Mr. Juan Orellana, and the registration number NGC 3419565-008 that has the unmistakable characteristics attributable to Mr. Eduardo Coronel. Juan Orellana engraver Eduardo Coronel engraver We can observe the characteristics that identifies the carver who made the stamp of each piece of 2 Reales 1833 that are shown in the photos above: - - We note that for the case of the die engraved by Juan Orellana, the finishes are rustic and of lower quality than the carving of Eduardo Coronel's die. - - The position of the birds located on the mountains are totally different between both engravers. This being the most relevant feature to determine which corresponds to each die. We can be seen that in Orellana's die, the birds have a horizontal posture (the head is aligned with its body and tail), while in Coronel's die the birds have upright posture (the head elevated well above its body). - - The formation of the valley between the mountains, that for the case of the cut engraved by Orellana, the overlap of the mountains establishes a meeting point (vertex), giving the form to the valley in V; unlike the Coronel die that is formed when the meeting of the mountain on the right makes a sharp curve to be mounted on the skirt of the mountain on the left, forming the valley in U. - - The finish of the slopes of the mountains are very different, noticing the fine engraving in the coin from the stamp of Coronel. - - The rustic design of the teeth of ring in the coin of Orellana, unlike the very good finish that is in the piece of Coronel. - - The finishing of the numbers that make up the year 1833, in which the difference in the shape of the digits is very noticeable, above all we can see how very different the number 8 is between both engravers. - And finally the detail in the lower part of the cornucopia, which for the case of the Orellana die is thick and very rustic, while in the Coronel die the finishes are fine. All of these characteristics identify the work of each of engraver enshrined in the coins of 2 reales of 1833 despite the few coins of 2 reales minted in this year they were made in different periods and contradicting what we have believed, that all coins of 2 reales were made in 1832 by Juan Orellana. We can observe that all the characteristics of Coronel die of 1833 (the position of the birds, the shape of the number 8 on the date, etc), they are repeated in the coins of 1 and 2 reales in the following 2 years (1834 and 1835) in which he was the chief engraver of the Quito's Mint, leaving an unmistakable record of these details. In addition, from the aforementioned, it allows us to deduce that the coin of 2 reales coined by Juan Orellana, should be much rarer than the 1 real coin of 1833 also engraved by him. I have only known the specimen that appears in the photo of this article, it has not been reported in the works of Melvin Hoyos and Ramiro Reyes, in which only the coin corresponding to the carving of Eduardo Coronel appears in both works, attributing them erroneously to Juan Orellana. We must remember that, of the 20,488 pieces that Salazzá reported in the 1836 report as total production of pesetas, only 1,600 were struck in coins of 2 reales until September 13, 1833 as reported by Salazzá, when he reports the impossibility of getting the screw; which means that the 1,600 pesetas that were produced before September 13 must have been carried out by Mr. Orellana, which is less than 8% of total production. This last statement is based on the order to produce coins of 1 real that was received by the mint, on February 28, 1833; article 1 mentions: "From this date will be struck in the mint, 1 real coins of the same type as the pesetas (“pesetas” in Ecuador was synonymous with “2 reales”), except that in the place where the numeral 2 is stamped, it will be replaced by the numeral 1 " – “La Moneda Ecuatoriana a través de los tiempos” second edition of Melvin Hoyos, pag. 103; which confirms that by the time the order was given to mint the coin of 1 real, in February of 1833, the coins of 2 reales already existed, and for that time, they could only come from the die engraved by Juan Orellana, who was the engraver of the Quito mint. The remaining production of 18,888 pesetas (more than 92% of total production), surely, had to be coined after the date of the report of September 13, 1833; which means that it could only be made by Mr. Eduardo Coronel, who by then was already the engraver of the Quito Mint. Conclusions As conclusions we can summarize everything mentioned so far in 7 essential points: 1. The test coins minted in August 1832 would not be 2 real coins as most historians suggest, because it would make little sense to have the mint trials on the least needed coins. 2. That the trial coinage should have been struck in the year 1832, because the mint had no way of guessing that the decree would not be issued until the following year. 3. To support both hypotheses, I support the existence of a ½ real coin registered by the NGC dated 1832, the ½ real 1833/2 certified by the ANACS and some pieces that exist with the warp in the last digit of the dates, which makes the presumption that they are the product of dies that were corrected. 4. Only 1,600 of the 20,488 pieces of 2 reales 1833 could be minted by Juan Orellana (less than 8%), they were the first pesetas. This is supported by the report of September 13, 1833 by Mr. Salazzá confirming that production up to that date. 5. The remaining pieces of 2 reales had to be engraved after September 13, 1833, with dies executed by Mr. Eduardo Coronel, because Orellana was no longer the main engraver of the mint. 6. Both coins of 1 and 2 reales of 1833 engraved by Juan Orellana must be extremely difficult pieces; with the 2 reales much more difficult to find than the pieces of 1 real. 7. Eduardo Coronel produced more than 92% of the total production of 2 reales 1833, while Juan Orellana in less than 8%; reason why to date had not found a 2 reales coin carved by Orellana. This allowed to attribute to Orellana erroneously the few pieces found of 2 reales, when they really belonged to Coronel.